Frappato. I just love saying it as it rolls off the tongue. It was a word I kept repeating as I opened a of Valle dell’Acate Il Frappato Vittoria Frappato DOC Sicilia 2015 and poured it into my glass this week. Fun to say and tasty to drink, that is why it is the Please The Palate pick of the week. There are hundreds of grape varieties indigenous to Italy. One of these varieties is Frappato which comes from the coast of Sicily. When you think Sicilian red wine, you might think Nero d’Avola, which is the main grape of the region. But Frappato is typically blended with Nero d’Avola for Sicily’s first and only DOCG Cerasuola di Vittoria. 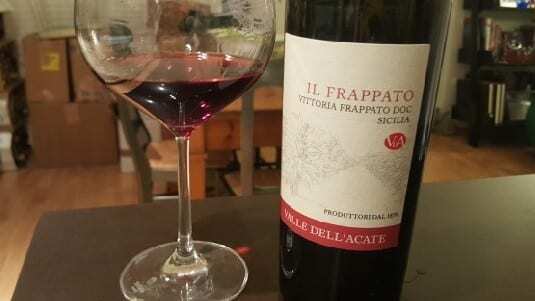 The Valle dell’Acate Il Frappato Vittoria Frappato DOC Sicilia 2015 comes from the area around the town of Vittoria in the province of Ragusa. Vittoria DOC can be red (frappato and nero d’avola) or white (ansonica). Valle dell’Acate was founded by Giuseppe Jacono at the end of the 19th century and today is run by the 6th generation of the Jacono famly, along with the Ferreri family. The 100 hectares under Valle dell’Acate consist of seven distinct soils and the grapes in Il Frappato come from black soil with white pebbles. Valle dell’Acate Il Frappato is 100% frappato. It is a ruby color wine with bright fruit aromas of blueberries, raspberries and blackberries as well as violet and herbal notes of sage. It is light-bodied with medium acidity and low in tannins. It is a wine that can be enjoyed with a variety of dishes, from cheese and salami to pasta and pizza to meats. It can also be chilled and enjoyed on its own. Such a versatile wine, Valle dell’Acate Il Frappato Vittoria Frappato DOC Sicilia 2015 is the Please The Palate pick of the week. This entry was posted in Wine and tagged Frappato, Italian Wine, Italy, pick of the week, Please The Palate, red wine, Sicilia, Sicily, Valle dell'Acate Il Frappato Vittoria Frappato DOC Sicilia, Wine by Allison Levine.